A couple of days ago, we had a mini ghabga, just a low key gathering, lounging around in our newly decorated Morrocan tent, watching our favorite Ramadan TV series, and munching on some "khafayif". The dress code was to be very very casual! 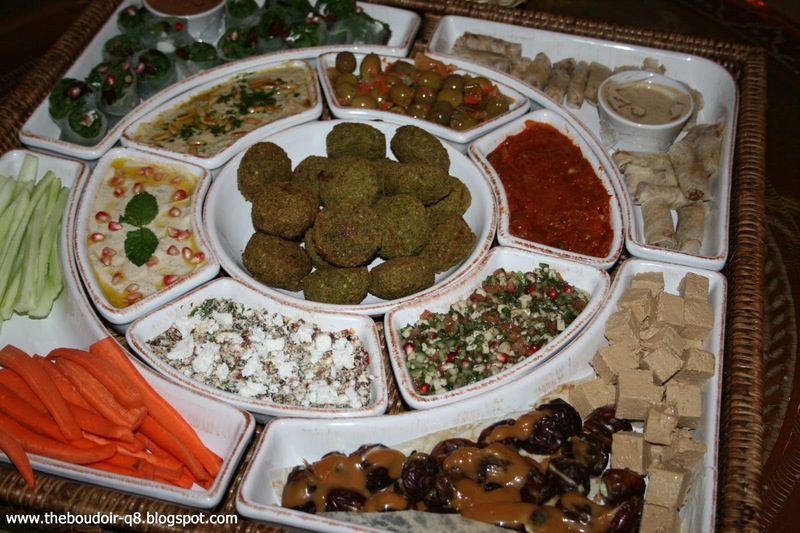 Anyways, this post is to give you tips in creating you own mini Ramadan gathering. Not an all out ghabga. The Nut Tree: is the place to go as recommended by a friend. I had bought some different types of nuts to put around the tent. It was mostly the sugared/honeyed types and a few salted different flavored ones. My selections were limited to cashews, pistachios, and peanuts, all of which were all time favorites. I have to add, I have no idea how much nuts cost and have never bought any, but it seems that this shop is a bit pricy. Nonetheless, it is very much worth it. I will have to review it sometime soon. Munch: I have reviewed Munch twice already, and this restaurant have always come in handy whenever I invited girls over. I wanted to try something from their Ramadan menu, specifially the Arabic Mezza Platter (KD 31). Everyone was probably still full from the futoor, and having heavy food was a definate no-no, talking from experience. The selection was perfect, dips, small wraps, bread, and some sweets. Everyone thought it was a nice idea to have that kind of platter, but it would have been even better if we did not have anything else, as it has it all. A clear con of this tray is its price! And the platter is to be returned to them the next day. Add another platter of mixed salty mini bites like kubbas, samboosa, pastries. Brownies Delight: For dessert I have ordered from my favorite brownies home business. I have written a review before. 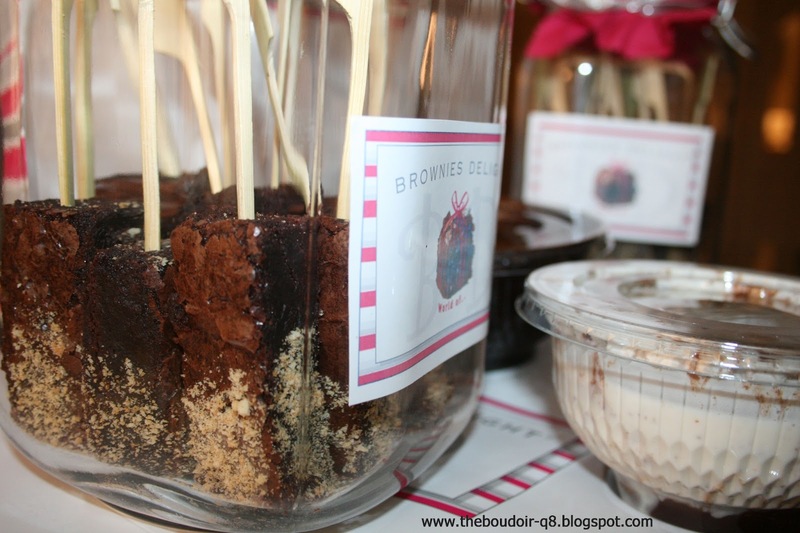 The same selection was made, brownie lollipops with chocolate and special sauce dips. No one has ever tried it, and everyone definately loved it. 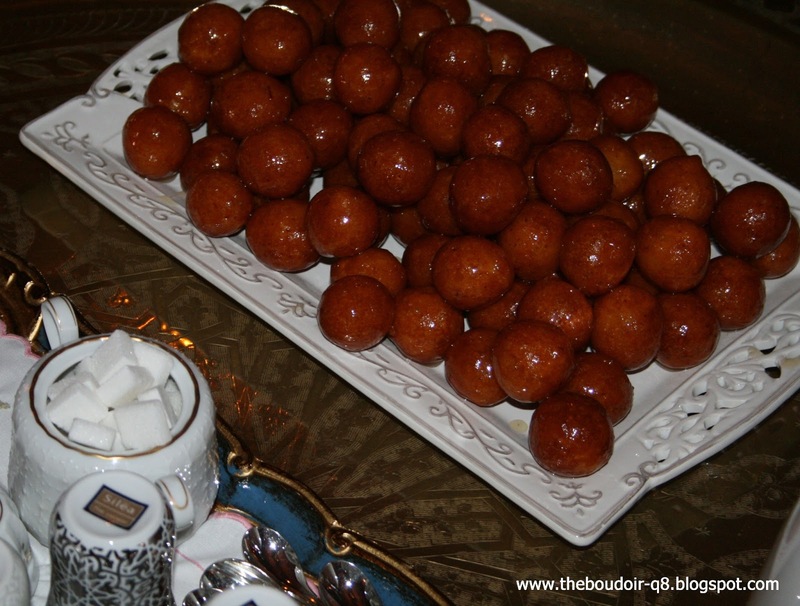 More sweet options: Lgaimat (or 9abilgafsha or qa6ayif) accompanied with tea and Arabic coffee. And with this I end my list. These are the basics. Don't over do it. Remember people are pretty much full and would rather have a cup of green tea and some sweet mini bites than a lavish buffet. And anyways, like in my case, everyone will probably be bringing a dish along, as I have feared and expected.